Move the bar across the image below. What do you see happening to the coral reef? On reefs all around the globe, massive branches of hot pinks and purples amongst bouquets of lime greens, orange-yellows, and bright blues are now off-white skeleton statues in piles of rubble and ruins, as you see above. 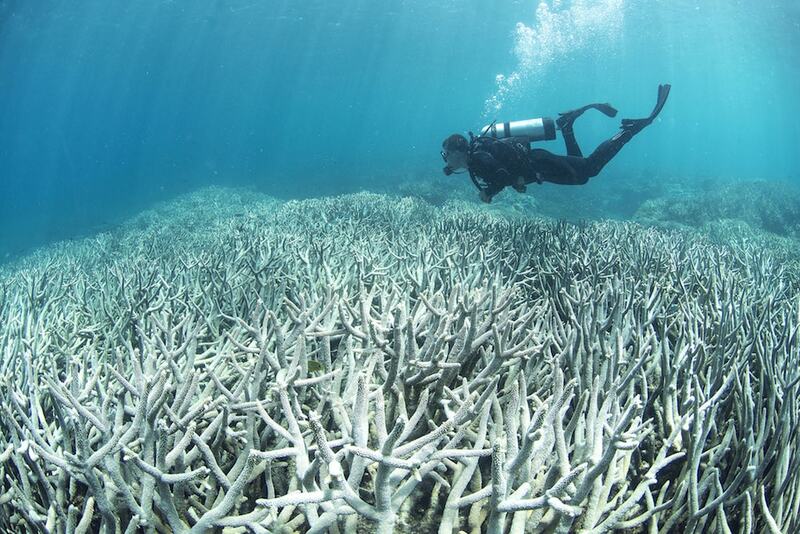 You are witnessing the before and after images of a coral bleaching event. Coral bleaching occurs when the small algae that live inside corals abandon the corals because of high water temperatures. The algae give corals their color, but more importantly, they convert sunlight into food for the coral. A bleaching event, therefore, signals that a coral reef is unhealthy and that its corals may soon die. Coral reefs are an incredibly important and emblematic part of Earth’s mysterious underwater world. These essential ecosystems provide for roughly 25 percent of aquatic marine life and serve as the ocean’s equivalent of tropical rainforests. Unfortunately, like much of the natural world, a range of human impacts have degraded these invaluable habitats. Sick, dying, and dead coral reefs, like the bleached one you see above, are becoming increasingly common, as corals around the world are suffering from overfishing, water pollution, reckless tourism, and most of all, warming ocean waters due to climate change. Click on each of the following threats to coral reefs to learn more. Some countries, including the U.S., have provided protection for coral reefs in the form of National Wildlife Refuges, Marine Reserves, Marine Sanctuaries, and Marine Protected Areas. Depending on the level of protection, the government restricts specific activities in a particular area of coral reef. These restrictions can be against oil drilling, fishing, dredging, anchoring, removal of species, and more. But are they working? In 2010, researchers spoke with Science Friday about whether underwater parks are effective at protecting coral. What potential issues are there with this approach to coral conservation? Do Underwater Parks Protect Coral Reefs? In this activity, you will learn how to tell whether a coral reef is healthy, and conduct reef health surveys virtually. Then you will use your data to decide whether you think underwater parks are effective at protecting coral reefs from human threats. 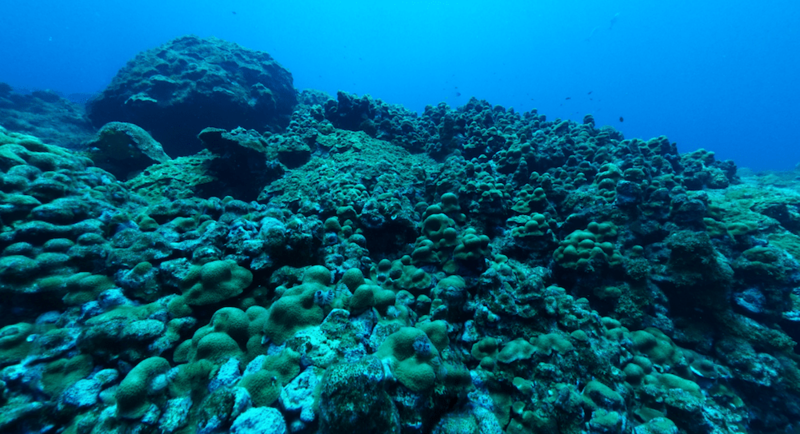 Take 5-10 minutes to check out the following two 360-degree images of coral reefs that NOAA currently protects in the Flower Garden Banks National Marine Sanctuary. One of the images is of healthy corals (“some of the healthiest corals in the world”), while the other is of unhealthy corals that have experienced stress and bleaching due to warming waters. 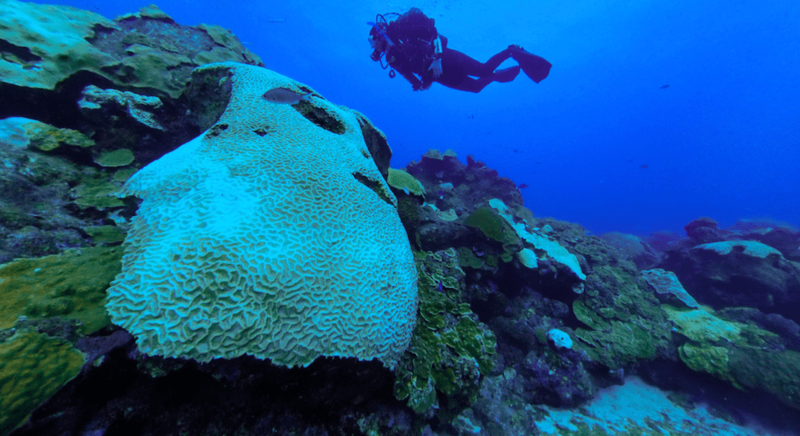 Explore some unhealthy corals here. What differences do you notice between the two reefs? What differences do you notice in the number of fish, the colors of corals, and the presence of green algae between the two reefs? Visually, what do you notice about corals that are unhealthy? Can you easily tell where coral bleaching has occurred? How can you tell the difference between a reef that has experienced bleaching and one that hasn’t? Reefs can be evaluated on more than just their appearance. Coral reefs are known for their immense biodiversity. This incredible amount of speciation leads to a beautiful symphony of sounds within the reef that can be recorded using a hydrophone. Below, you’ll find two underwater audio recordings from the Great Barrier Reef near the Lizard Island Research Station, captured in 2014 and again in 2016. Find a quiet place and use your critical thinking skills to make observations about both 30 second clips. Listen to the each of the audio recordings from the reef two or three times. As you listen to each recording, record as many observations of what you hear as possible on your Reef Audio Survey Data Collection Sheet. When you’ve finished collecting data for the two audio clips, note any differences you notice between the two tracks. Try and be as specific as possible. For example, if a sound pattern is louder in one track than the other for all or part of the recording, be sure to specify what the sound is and exactly how it is different from one recording to the other. It’s okay to go back and forth between the tracks to help you gather. After you’ve finished, make a claim based on your collected data as to whether audio recording #1 or audio recording #2 is the recording from a healthier time on the reef. Use specific evidence from the data you’ve collected to support your claim and explain your reasoning why that evidence supports your claim. Coral researchers will scuba dive or snorkel on a coral reef and count the number of different species they see there to monitor the health of that reef. Indicators of reef health include high species diversity including large predators, whereas indicators of poor reef health include very few types of animals. Scientists can use data from this type of survey to document changes in reef health and to evaluate whether protection strategies, such as marine-protected areas or policy changes, are positively impacting coral health. For the next 20 to 40 minutes, you will use Google Street View images of coral reefs collected by The Ocean Agency to conduct a survey of coral health in protected and unprotected coral reefs, just like a research scientist, without getting wet! 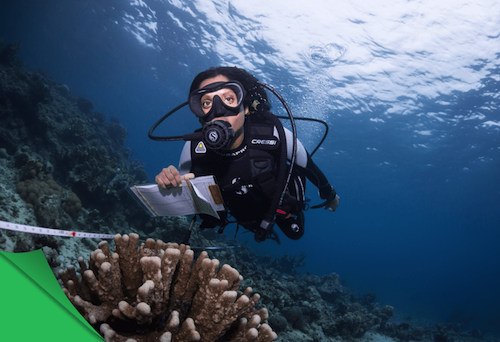 Using the Data Collection Sheet to record your observations, you will conduct a virtual survey of a protected refuge at Palmyra Atoll, and an unprotected reef near an airport in American Samoa. To make sure that your observations represent each reef as a whole, you will repeat your observations at three different locations on each reef. At what site did you observe the most living, brightly-colored coral? At what site did you observe the most bleached (white) or dead coral? At what site did you observe the most individual small fish? At what site did you observe the most schools of fish? At what site did you observe the most large fish? At what site did you encounter the most biodiversity? Can you conclude whether or not a marine sanctuary that protects corals, like Palmyra Atoll, promotes healthy corals compared to areas where corals are not protected, like Coconut Point and the area around Pago Pago International Airport? Does a marine sanctuary promote an abundance of fish, or a larger diversity of fish? What other conclusions can you draw from your study? What are the limitations of your study? How would you improve it? If this were a professional study, we would take surveys at multiple sites over a period of time to get accurate data. You can see the results of a more extensive study by viewing the XL Catlin Seaview Survey, a coral study conducted by scientists around the world over multiple years. 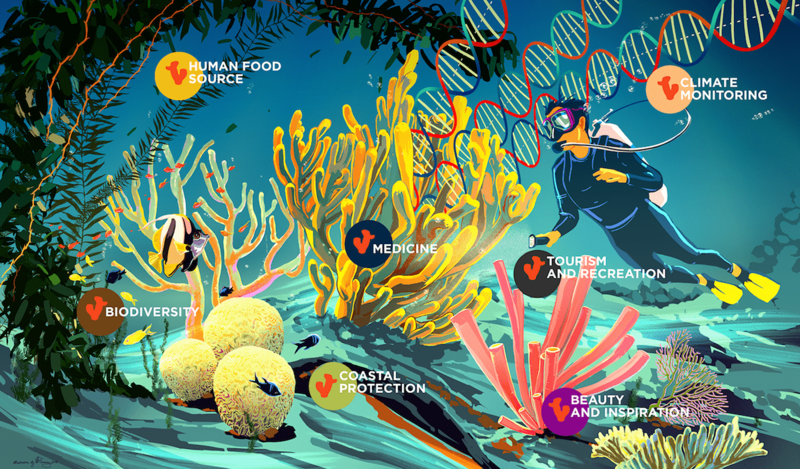 Activity 4: Plan For The Future—How Would You Protect A Coral Reef? Despite our dependence on coral reefs, humans are linked to nearly all the reasons they are in decline. What else can we do, beyond creating more marine protected areas, to prevent the further deterioration of coral reefs? Some creative solutions have already been tried. For example, Australia’s government launched a contest calling for scientists around the world to develop a plan to promote coral growth on the Great Barrier Reef. To win the contest, the proposal had to be appealing to tourism operators, the fishing industry, and coastal communities, as they are all uniquely dependent on the health of reefs. For this concluding activity, you will have an opportunity to dive deeper into ways that coral reefs can be protected and work creatively towards advancing new approaches to coral conservation. Individually or as a class, research a local or national coral reef, marine ecosystem, or freshwater ecosystem that could use protection. What threats does it face? What evidence suggests that the ecosystem needs additional protection? Research what local, national, and international groups are doing to protect the coral reef or other ecosystem that you identified. Brainstorm new ways you could protect the habitat you identified, or ways that you could improve existing attempts to protect it. 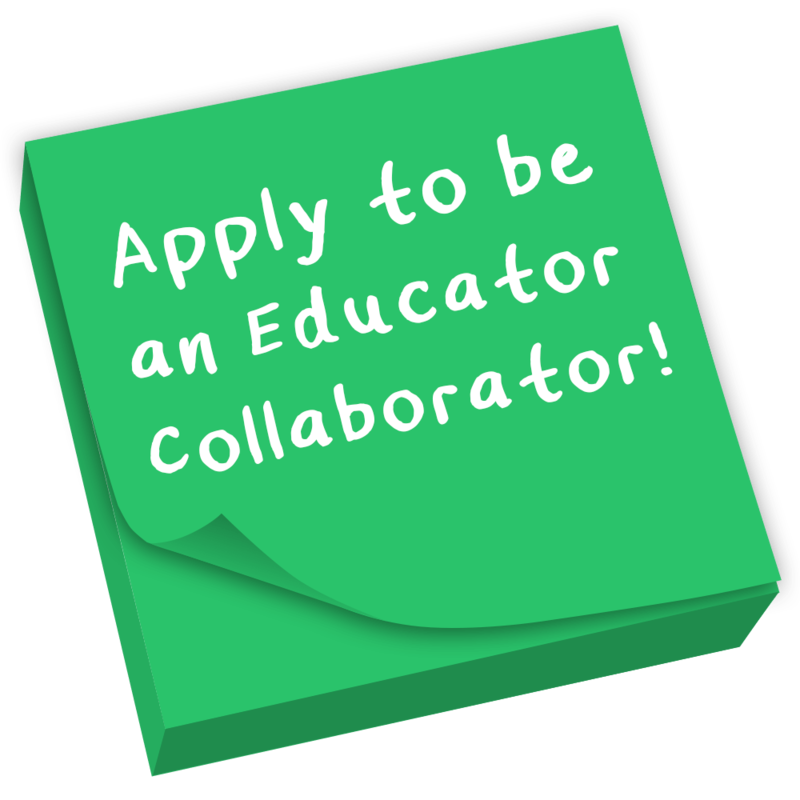 Write a proposal about how you would protect the ecosystem or habitat you selected. Write letters or postcards to your representatives sharing your idea with them! Call your representatives and share your opinions and ideas about conservation! Create a PSA/school ad campaign on how to protect your chosen ecosystem. Write an article for your school paper on the conservation efforts you found and student ideas for improving on them. 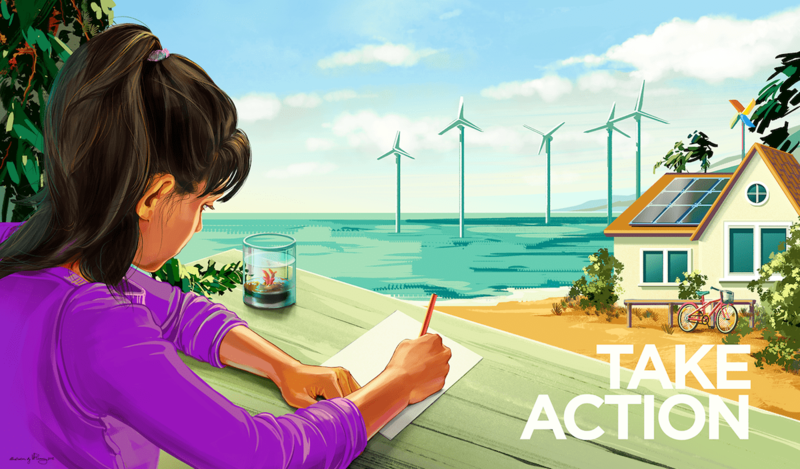 Create bookmarks to share with schools and local libraries on actions that students can take to help protect local ecosystems. Need some inspiration? Below are a few other types of coral restoration and protection projects that you can choose to delve deeper into or use for inspiration for your project! Since human-induced climate change and warming ocean temperatures are the top threats to coral reef health, laws that limit the use of fossil fuel consumption and C02 emissions will encourage the use of renewable energy and may help protect reefs in the future. Individuals and their communities can make personal choices that that reduce the amount of carbon dioxide that enters the atmosphere and ultimately warms the oceans. Oxybenzone, a chemical found in most sunscreens, is toxic to many coral species and other marine life. The state of Hawai’i has recently approved a bill banning sunscreens containing this chemical. Many coral reefs are so fragile that visiting them at all can cause harm. Certain reefs may benefit from a partial or total ban on visitors, allowing them time to recover. It may seem futuristic, but some scientists are considering using a gene editing technique to make corals resistant to warming temperatures. Humans can gather small fragments of coral to string up in shallow areas of the ocean to create a coral nursery. Here, coral pieces grow to a healthy size and are then placed back into damaged reefs where they can reproduce naturally. Take a look around a real coral nursery here. Another method of making more corals is semi-captive coral breeding. This SciFri video explains how scientists in aquariums are helping grow new corals. Molly Adams is the New York Aquarium’s outreach coordinator. She specializes in designing and delivering hands-on marine conservation programming to the city’s five boroughs. As the founder of the Feminist Bird Club, she also spends her time working with birders of all backgrounds to get outdoors in urban areas while fundraising for basic human rights.